On her show 'The Kelly File' on Wednesday, Megyn Kelly raised eyebrows responding to a Slate article written by a black journalist named Aisha Harris who suggested (playfully and seriously) that the time was ripe to retire the fat, white bearded old Santa Claus we all know with a more 'friendly, secular' inclusive alternative. How about a jolly penguin? The penguin idea was inspired by the Easter Bunny, Harris explained, it was her response to the nation's increasing diversity. 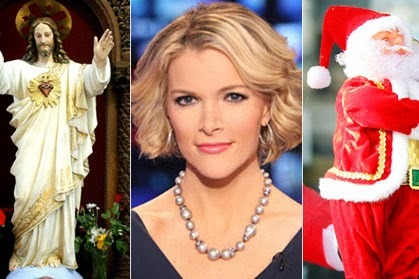 For Megyn Kelly, however, it was the opening of a new front on the war on Christmas. Perhaps that's why her first impulse was to shield the ears of the (presumably) white kids who were watching. So much for fair and balanced, never mind accurate. Thing number one, what kids watch Fox news? Number two, Jesus was a Levantine Jewish man from the Middle East. And three, St. Nicholas was Bishop of Myra on the southern coast of Asia Minor in Turkey, and was probably Greek or Turkish. I don't know what kind of history Kelly's teaching her children Yates, Yardley and Thatcher – or what illustrated Bible she's consulting – but it's safe to assume that neither of these men looked like a likely Norman Rockwell subject. Besides, many would consider both of these men to be fictional characters (or at the least, they would doubt their supernatural abilities) so shouldn't that mean we are free to make them white or black or Asian, if we're so inclined? No, no, no, no, no says Kelly. It doesn't have to change. But she might want to reflect a bit more. In the first century, records show, most 'white men' were barbarians living in the forests of Europe and painting their faces blue. And Kelly should also know, as a sometime Irish American, that the modern image of Santa Claus was created by the notorious anti-Irish bigot Thomas Nast (he started caricaturing the Irish when he was a teenager and he continued to do so all his life). If she's obsessed with lineage and ethnic accuracy, she might want to reflect on what she's promoting. But yanno, math is hard you guys. Can't a thing be true if it feels like it should be true? Am I right? Help me out here? Who's really in need of reassurance here? You could see where she was going with her theories. It's only a few steps from Santa is white to Jesus is white to Almighty God is white. That's all rather controversial. Conversely that means that Satan is white too. Oh wait, I've been caught in her tractor beam of stupid. I think the only really sensible thing to do is change the channel.